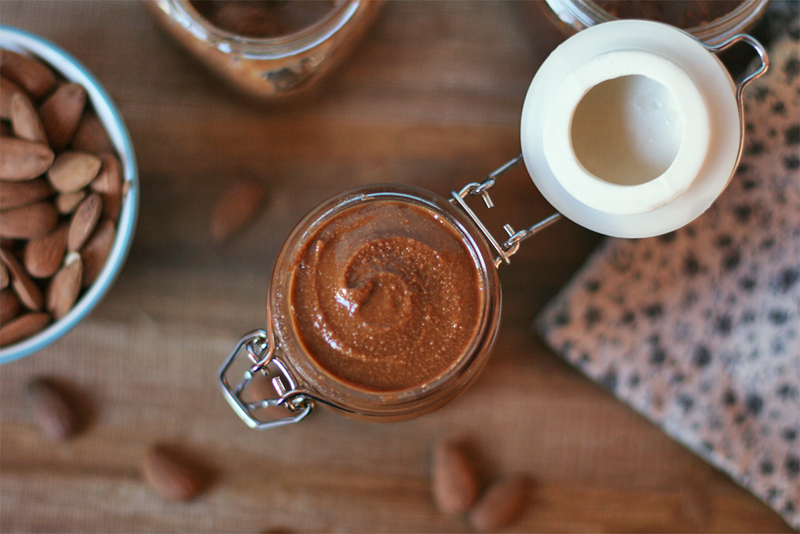 This is not the average almond butter recipe, it's taking your homemade almond butter to the next level and giving your taste buds a trip to Cacao-Land. There's no need to remind you that making your own nut butters at home are a million times better than buying those overpriced butters at the organic grocery stores; specially the almond ones...damn! They are super expensive here in Barcelona and can burn a hole in your pocket. So yeah, I did tell you again that, if you have a powerful food processor or high-speed blender, go buy almonds in bulk (always organic, if possible) and feel the magic of seeing how a bunch of super healthy almonds can transform into a smooth, shiny, delicious and still-good-for-you chocolaty butter. You can choose to buy your almonds already peeled or with skin. Usually raw unpeeled almonds are cheaper than the others, but if you feel lazy and don't want to remove the skins off almonds (or you simply can't wait to eat your butter) then buy raw peeled almonds. Some people prefer to make almond butter leaving the skins on but I've tried both ways and highly recommend you to discard the skins, this way we'll have a smoother texture and the roasty flavor won't overwhelm the cacao flavor. 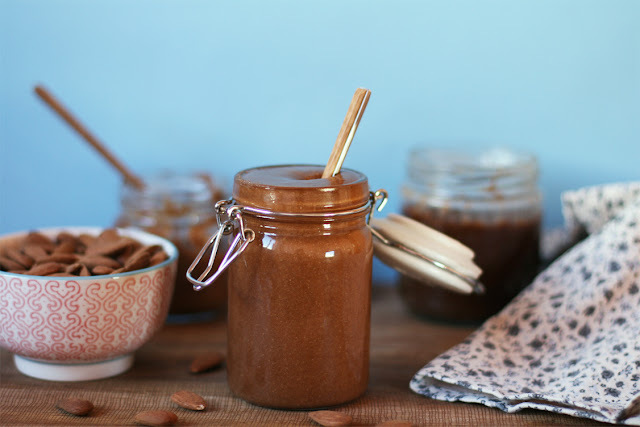 I found an easy and life-changing way to blanch almonds at Tory Avey's website, you can find her easy and awesome tutorial here, trust me, this is hands down the best way to skin almonds. 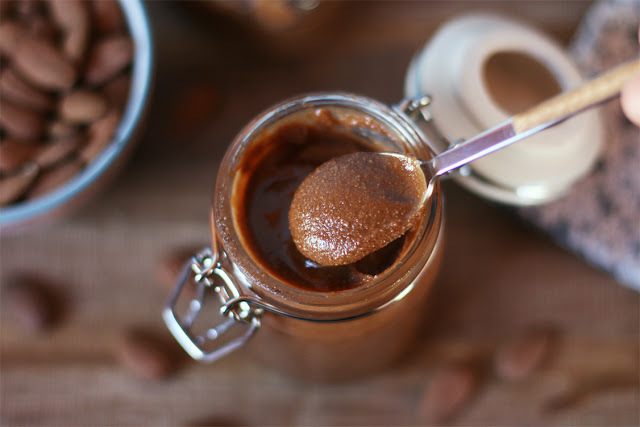 Nut butters can seem a bit trickier than other recipes but if you follow some simple steps and read my tips at the end of the recipe (see 'Notes') you will enjoy a super flavorful and totally addictive chocolate almond butter in less than 15 minutes. I love to spread it on a toast with banana slices, shredded coconut and cacao nibs, or stirring a generous tablespoon in my morning oatmeal or porridge; and also as a dip with apple slices, which is one of my favorite ways to snack after a workout. 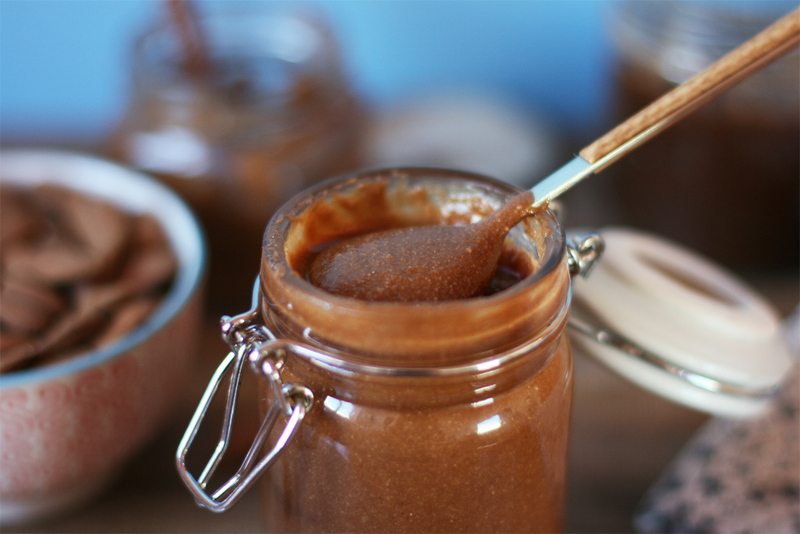 What's your favorite nut butter? 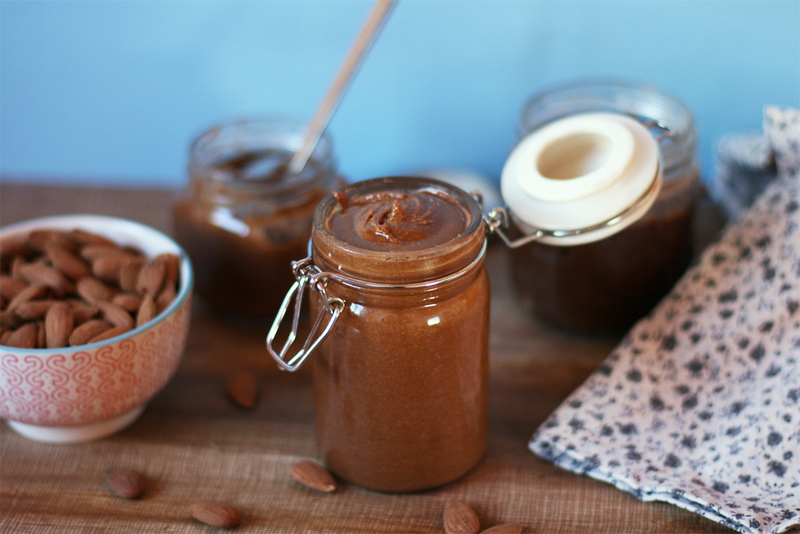 Have you tried other variations of almond butter at home?...and most importantly, are you guys already preparing your Easter recipes?! Cause I can't wait to show you what I'm planning to do! Off to the kitchen I go! 2 cups raw almonds, unpeeled. 3 tablespoons raw cacao powder. 1 1/2 teaspoons pure vanilla bean powder. 2 or 3 tablespoons coconut oil, melted. 2 tablespoons pure maple syrup, at room temperature. 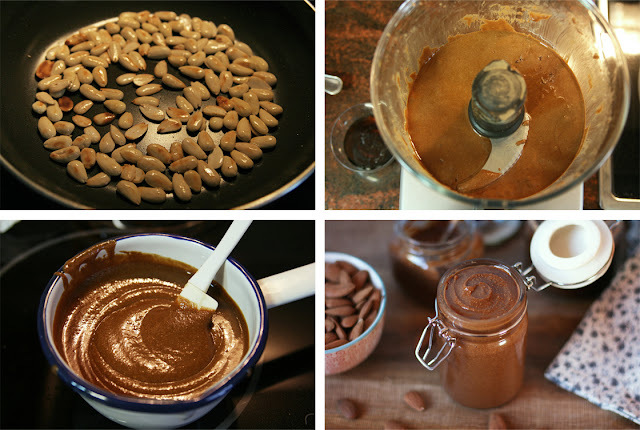 Remove the skin off your almonds (this method works like a charm). Lightly coat a frying pan with coconut oil and toast the almonds until they look golden and release a toasty scent. Let them cool a bit to prevent the bowl of your food processor from over heating. Place the almonds, cacao powder, salt and vanilla bean powder in the bowl of your food processor. Process until the almonds have crumbled and the mixture looks like a grainy powder. Gradually add in the coconut oil (melted) and keep processing until a ball forms, you will have to stop and scrape down the sides of the bowl a few times. Continue to process, the ball of paste will break up into a paste and a few more minutes later it'll start to look smooth, glossy and almost liquid. To make sure your butter is really smooth process for an extra minute or two. Stop the food processor and finally add in the maple syrup, stirring slowly by hand and making sure the syrup is not too cold. I prefer to leave the maple syrup at room temperature before beginning with the recipe, the butter at this point is quite warm and it might 'curdle' if we add a cold ingredient and keep processing. 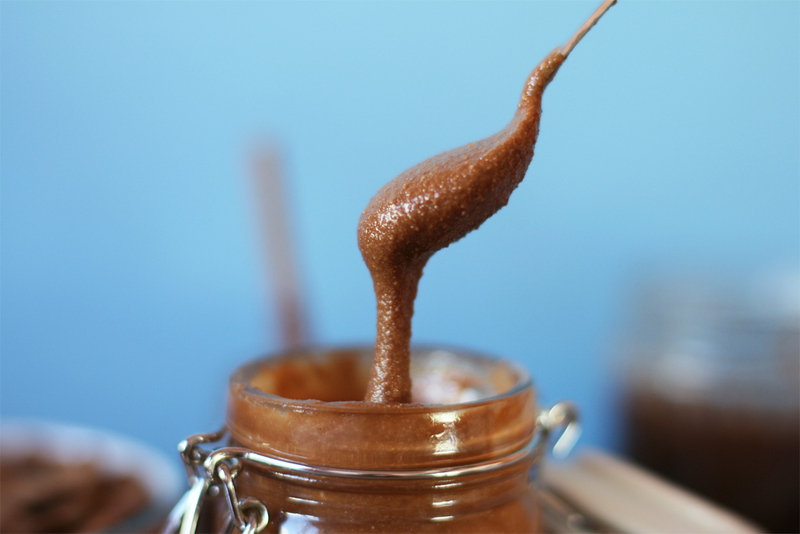 You can also opt for leaving the almond butter unsweetened but it tastes extra good with these 2 tablespoons of pure maple syrup. Transfer the butter to a clean jar, cover and keep refrigerated. The butter will firm up after setting in the fridge but if you leave it at room temperature for 5 minutes approximately it'll soften again and ready to spread. Oh yum I would literally put this on everything! 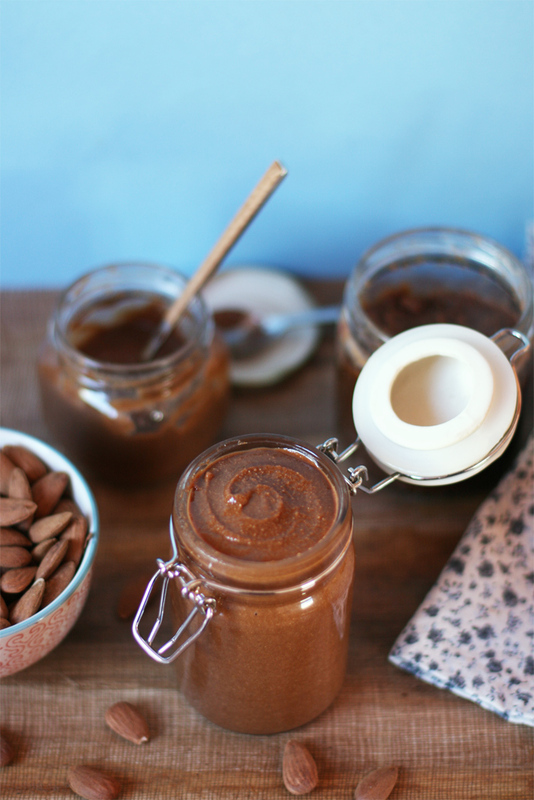 I LOVE chocolate almond butter, but never made it myself. This version looks amazing!